You don’t have to fly international routes in a Boeing to appreciate our Captain’s Bag. 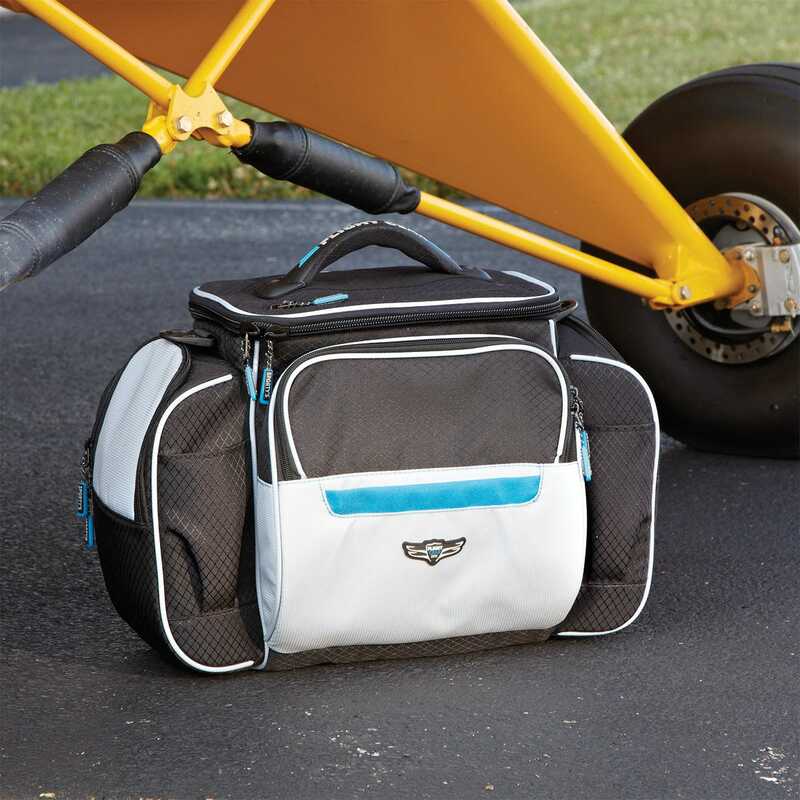 This bag has plenty of room for all your pilot supplies and a change of clothes. 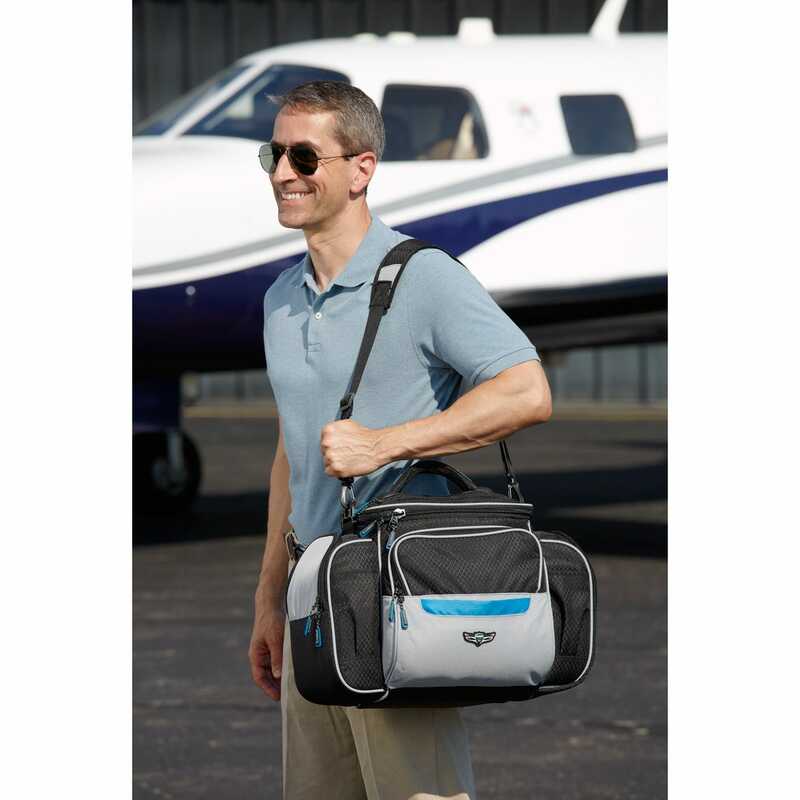 Perfect for the pilot who has more to carry, the Captain’s Flight Gear HP Bag has a pass-thru entry on the top flap for easy access to your iPad. 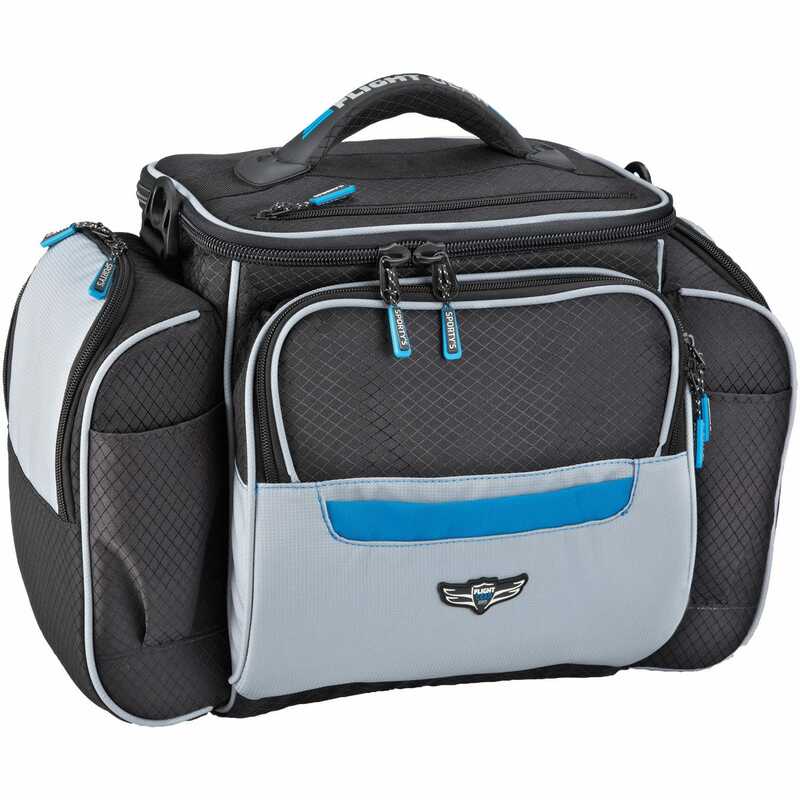 • Massive main compartment measures 12” l x 8” w x 12” d.
The Captain’s Flight Gear HP Bag provides maximum carrying capacity. Measures 18” l x 10” w x 13” h overall. Optional embroidery available on the front flap. Includes shoulder strap. I'm a new Flight Instructor and needed something to put all my gear in, and was willing to put a little more money into something higher quality. This bag did not disappoint! It has pockets inside pockets (and I'm still finding more pockets) for everything you need. I got mine embroidered with my name as well, and it turned out sharp and clean. My DC headset fits into the end pocket, and I don't have enough stuff to fill everything else up yet, but it's been perfect so far. I would say that's it's a big flight bag, so it may be bigger than same may need, but the interior space makes it worth it. 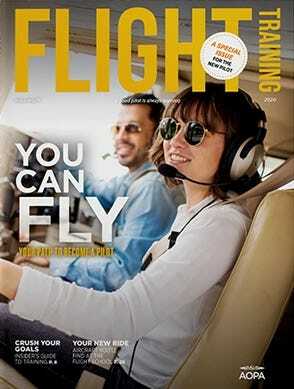 I've noticed that mine is bigger than most around the flight school, but it works perfectly for what I have! The build is pretty solid, but since it's still fairly new, I can't reliably rate the durability, but it seems like it should handle the daily abuse of an active pilot. It was a disappointment to find out that the inner size of the main compartment does not accept the document size A4 (european standard) the difference is about 25/30 mm in horizontal dimension so the optimal use without stress is not possible. Also height could be 30mm higher enabling a much better usage. I just received it and I love the features. Thank you for following up to see that I received it. I just bought the bag and transferred all the flight gear from my very large, and untidy, leather bag, to this modern marvel of compactness and organization. Many years of toting around a leather "gym style" bag, that always was an eye sore, and mess. But this new bag fits it all, and provides easy access during flight much easier, than the previous bag. I bought the Captain's bag for my Son as a Christmas Present. He has been using it since and I'm delighted to say he is thrilled with it . He is so pleased as it has a place for all his items with easy access on top. Everything is great but he did say not much room for a spare set of Clothes as advertised but overall a great but he would highly recommend this bag. One of the outer pouches arrived undone at the seams. Fantastic BAG!!! Gear Mods a must add! Really is an impressive amount of space. 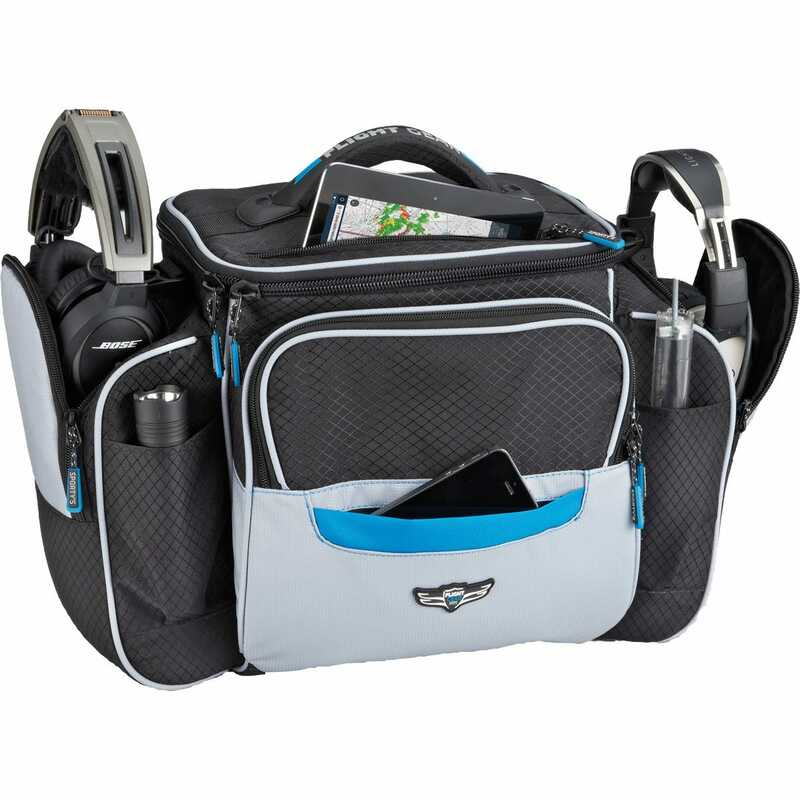 Great storage compartments and Dual Headsets..
Love the Gear Mods and how they work with this bag. I must admit, when I opened the box and looked at the bag I was a bit unsure as to whether it would live up to my expectations. And then I started to transfer 10 years of accumulated "stuff" from my old bag to the new one and I was very impressed. 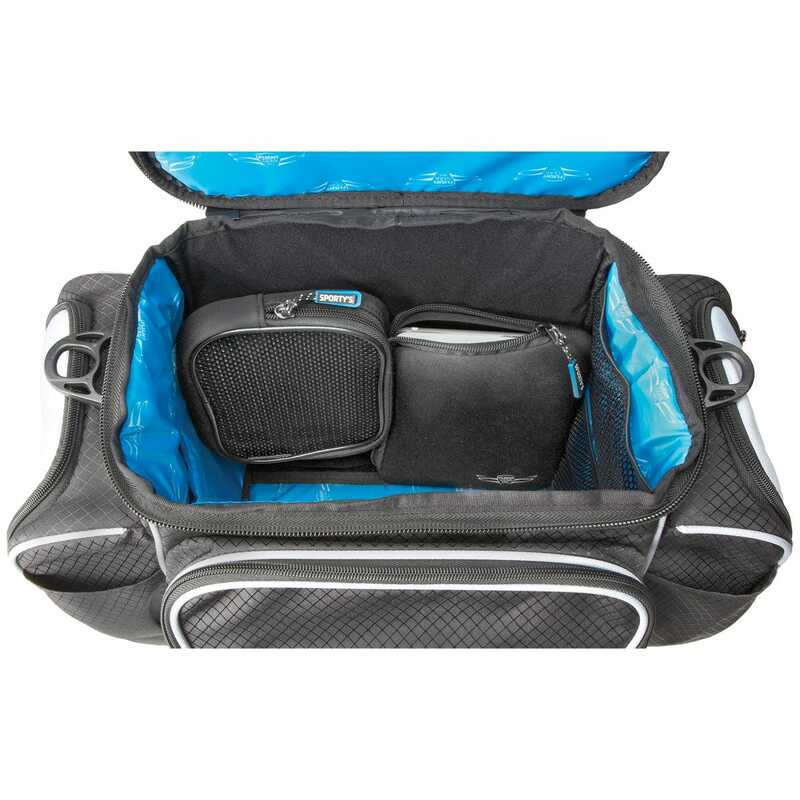 The compartments allowed me to organise my things in a more logical manner, the add-on pouches attached easily and again, gave me additional organising capabilities and the bag actually has a lot more room than it appears to have. Bottom line - I'm very happy with it and would highly recommend it. Will the Bose A20 Headset WITH the Bose headset bag fit in the SIDE pouch or just the center area? BEST ANSWER: No, it will not fit in the end pockets. But it will fit in the main compartment. However, the end pockets are padded, so the case isn't needed. 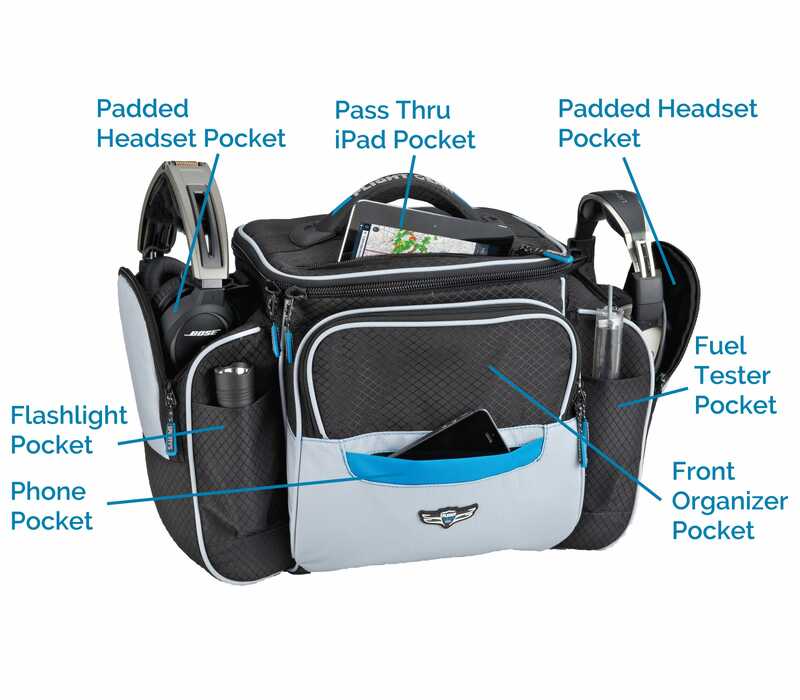 Can you do a what's in my flight bag product video featuring the flight gear hp captain's bag??? BEST ANSWER: I will ask them to do that. What does the embroidery look like? Do you have any photos with sample embroidery? 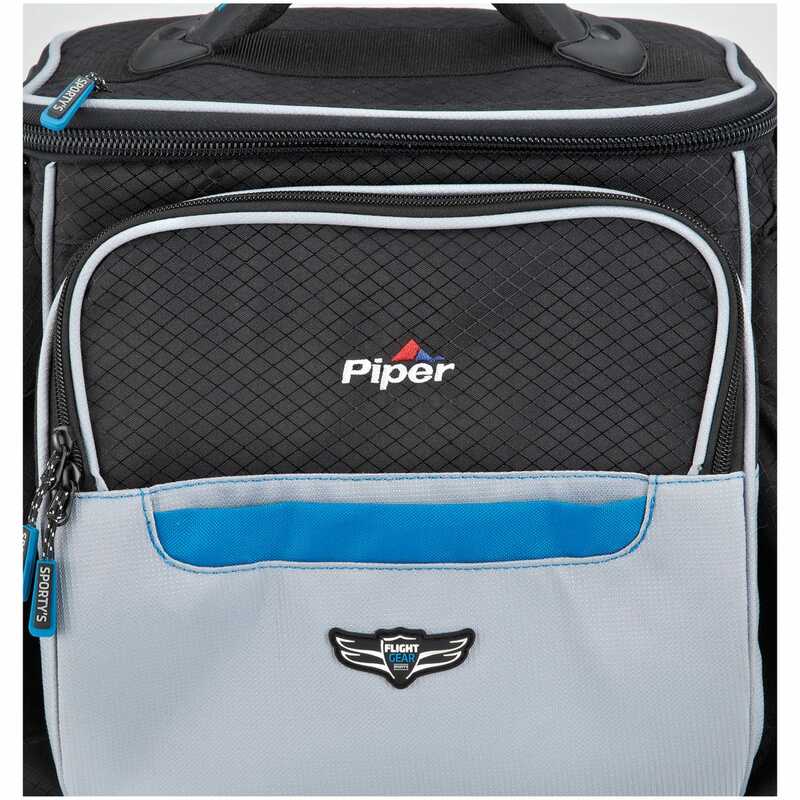 I ordered this bag for my son with his name on it. Looks absolutely fabulous. 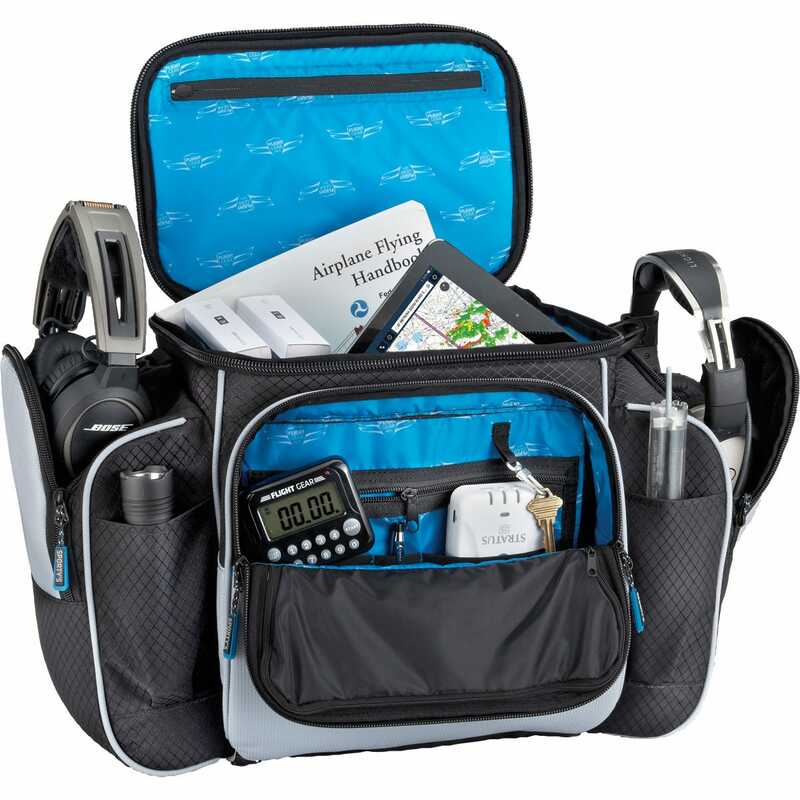 Can you do a product pirep video featuring the flight gear hp captain's bag and post it on your website?? BEST ANSWER: We are working on videos for all of our flight bags. Please watch our website. We do not have a date that the videos will be available. Can someone make sure that the ASA 13.5 inch rotating plotter will fit in the captain's bag? Can you get schematics for The flight gear hp bags??? BEST ANSWER: We are not able to provide schematics or technical drawings for the flight bag. Can a flight helmet fit in the main compartment? BEST ANSWER: Can't say for sure. It'd be tight. Not much room for anything else. I fly with a Bose headset and store it easily (without its case) in one of the side pockets. The bags works great for me! Does the regular binder can fit? Also is the headset pocket can fit for bose headset bag? 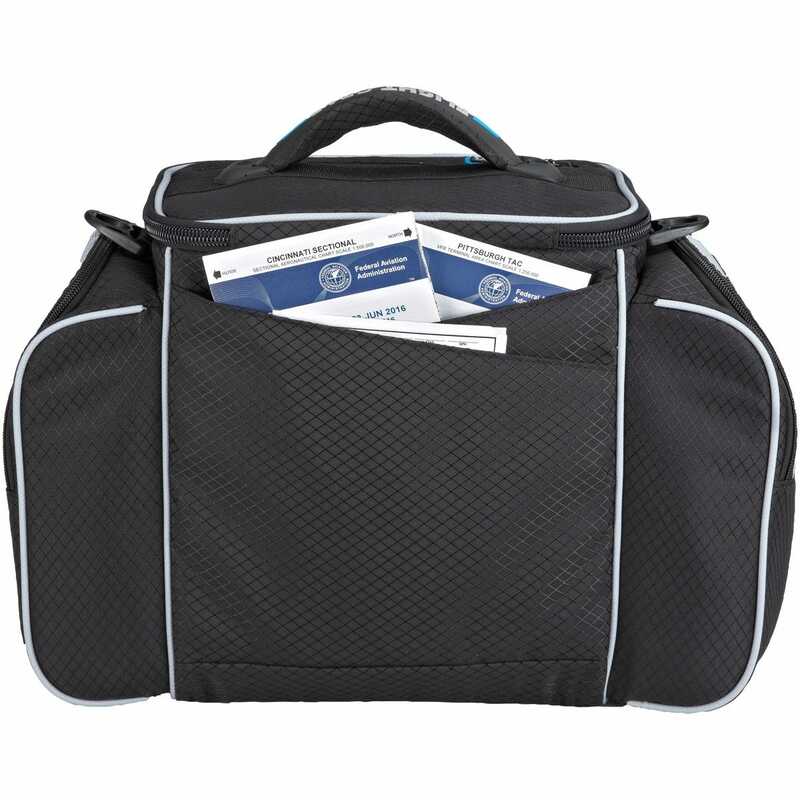 BEST ANSWER: The bag will fit a regular sized binder in the main compartment. A Bose headset by itself will fit easily in the end pockets, and they are padded to protect the headset so you really don't need the headset bag. However, if you want to keep that, you could fit the bag in the main compartment with plenty of space to spare. I have a lightspeed zulu 2 headset with its own carrying case. Does anyone know if the case will fit in the end-pockets? My Bose headset fits in the side pocket just fine. 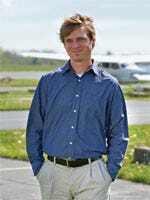 Can I bring as a Carry on Item on a plane, such as Delta as I would like to bring it when I go on vacation, as sometimes I visit the regional airports and rent a Cessna for a few hours? BEST ANSWER: You should be able to. I would recommend you check with the airline that you are flying on. will the side pockets accommodate Lightspeed headsets? BEST ANSWER: Yes, it will accommodate the headset. Will the dedicated iPad pocket fit the newer 10.5" pro with a case? BEST ANSWER: Yes, it will fit the 10.5. BEST ANSWER: I will send your request to our catalog manager. BEST ANSWER: Standard shipping is 3-5 business days. We have options for two and one-day service. Can the captain's bag fit far AIM, airplane flying handbook, pilots handbook of aeronautical knowledge, jeppessen binder, AFD, aviation whether book, kneeboard, and more?? BEST ANSWER: Yes, you should be able to fit those items in the main pocket of the captain's bag. 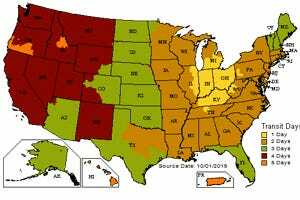 Do you know when your new product videos will be available? BEST ANSWER: I do not have a time frame for the new videos. 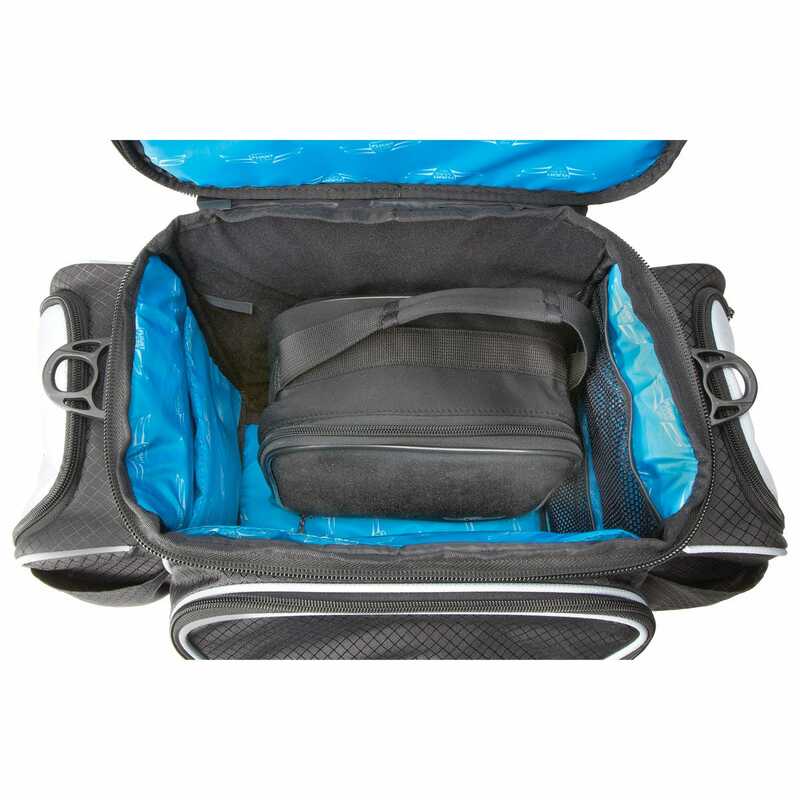 How well does the hp tri-fold kneeboard fit in the captain's bag? BEST ANSWER: It fits very well. How can a 13.5 inch plotter fit in the captain's bag if the captain's bag main compartment is only 12 inches??? BEST ANSWER: The plotter fits diagonally in the main compartment. is the captain's bag main compartment 14 inches long? Will the ASA 13.5 inch rotating plotter fit in the captain's bag? BEST ANSWER: Yes, it will not. BEST ANSWER: The pocket measures 10" h x 6" wide. Hi. The description says the captain's bag is 13 inches high does that include the reinforced carry handle? I would also like to know the exact dimensions for the captain's bag. also the dimensions of the padded headset pocket and if I can find some captain's bag schematics? BEST ANSWER: The height is the inside height of the bag. The headset pocket is approximately 6" wide and 8" high. 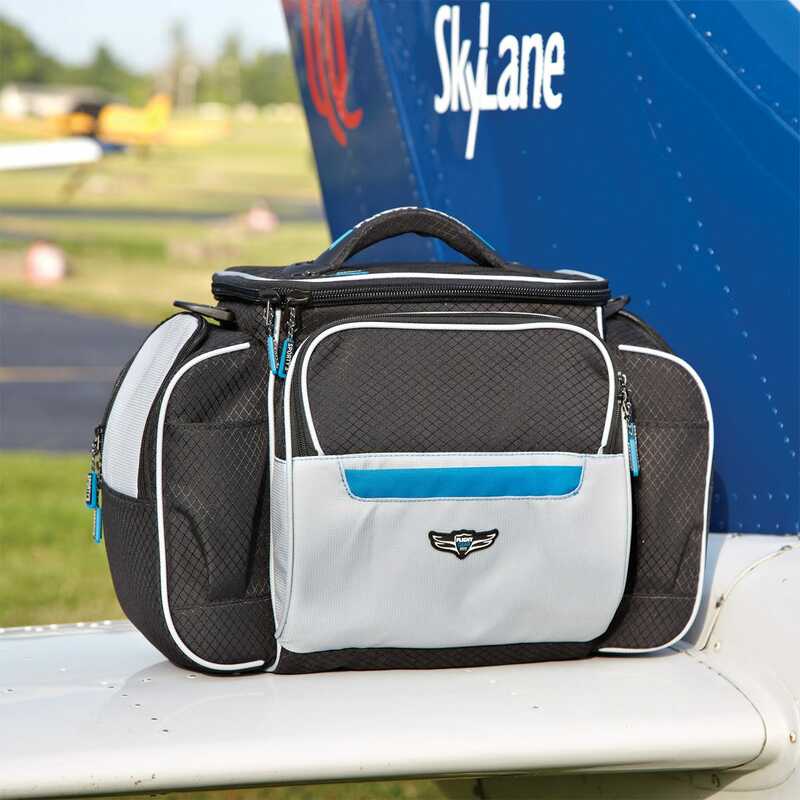 Is the crosswind bag roomier than the Captain's Bag?? 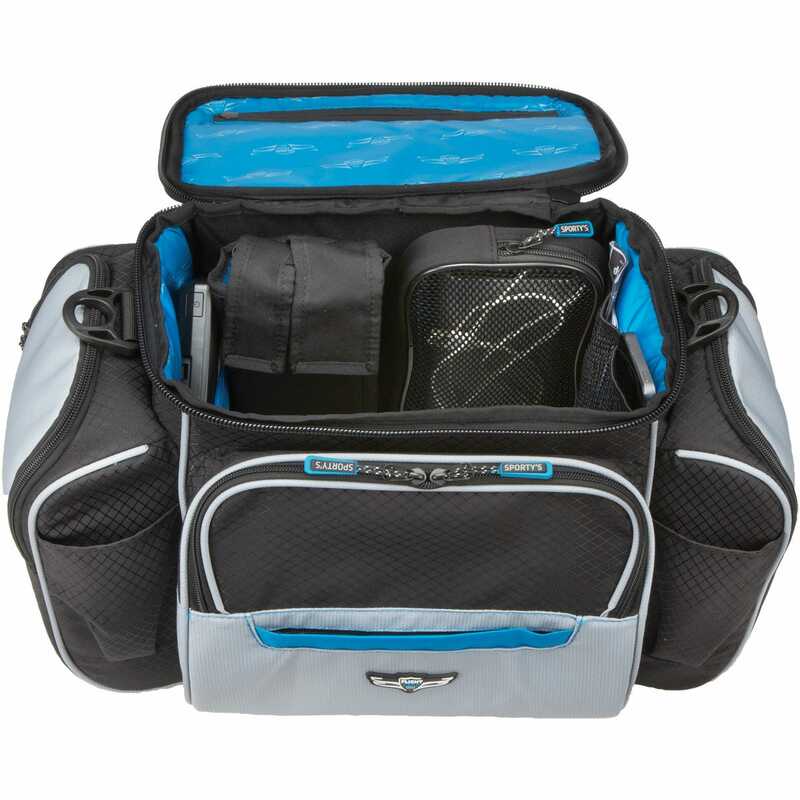 BEST ANSWER: No.... as this crosswind bag only has one side pocket..... and the Captain's Bag has side pockets on both sides. 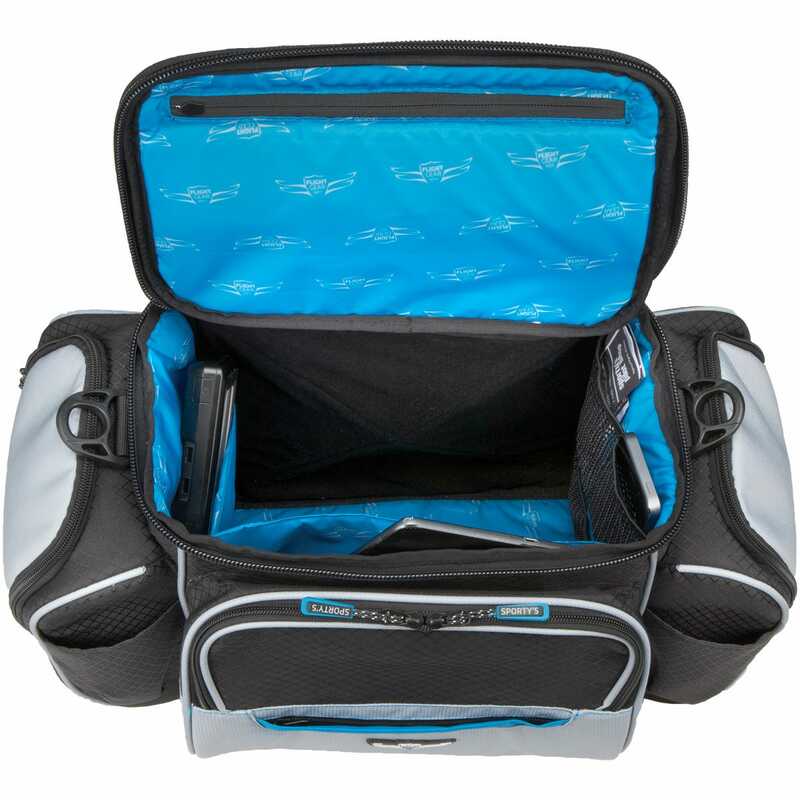 Can binders fit into the Captain Flight Gear Bag? BEST ANSWER: Yes, I keep a full-sized notebook in it. I use a side pocket for my Bose headset, without its case though. I've had mine since it came out over two years ago and love it. Do you have any pictures of the available logos? BEST ANSWER: Yes, please go to the products web page. Scroll down to the bottom of the page then click on the See all logos button. Will Lightspeed Tango fit in the side pockets? BEST ANSWER: Yes, the Lightspeed Tango will fit in the side pockets. How many 12l x 11h x 1w binder fit in the main compartment? BEST ANSWER: 2 the most if you don't have lots of stuff to carry. how about David Clarks H10-13.4 headsets ? BEST ANSWER: Yes, the DC H10-13.4 will fit into this bag. Will a 12.9" screen iPad Pro fit in main compartment? BEST ANSWER: Yes, a 12.9" screen iPad Pro will fit in the main compartment and there is plenty of room if your iPad has a case around it. I carry my iPad 2 in the main compartment and I have plenty of room for my FAR AIM, Pilots Operating Handbooks, charts, etc.